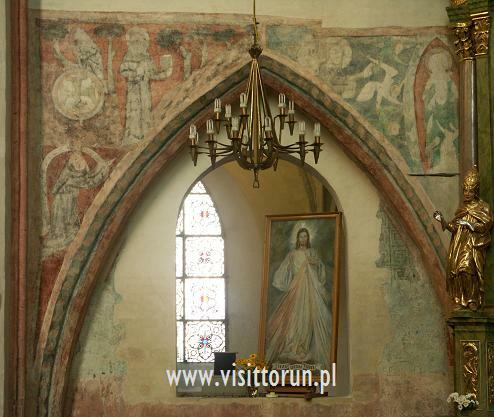 The post-Franciscan Church of the Assumption of the Blessed Virgin Mary (Polish: Kościół Wniebowzięcia Najświętszej Marii Panny or in short: Kościół Mariacki), erected in the second half of the 14th century, is one of the most outstanding artistic and architectural achievements of sacral architecture in Poland. 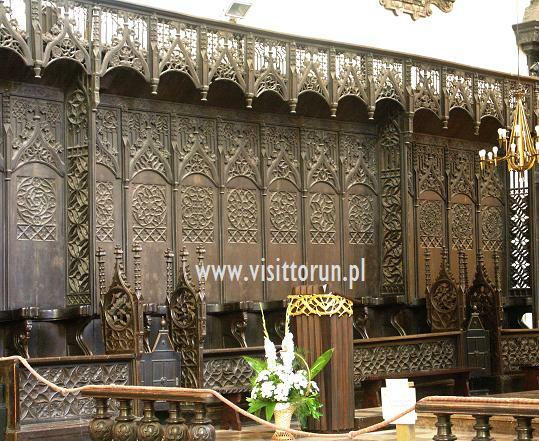 In the 14th century it was the highest hall church in Central Europe with the naves and aisles 26.8 metre (88 feet) high. 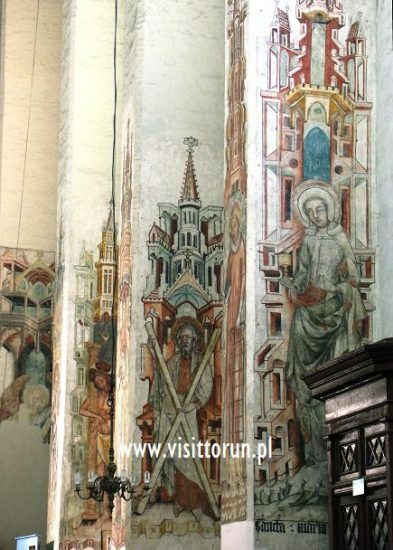 The church provided inspiration for the extension of St. Johns’ Church in Toruń and St. Mary’s Church in Gdańsk in the 15th century. According to the Franciscan rule, the church does not have a tower but three rather small ave-bell towers instead. The church and the cloister remained in Franciscan hands up to the Reformation period, i.e. up to 1559. The cloister, which was the oldest and most significant in the whole of the Teutonic state, was the residence of the Prussian custos. Here during the synod of 1243 a papal bull was announced dividing the Teutonic state into four dioceses. Interiors sightseeing: the church is in religious use thus the visit is possible outside the mass hours only. The church is open for visitors all year round, all day long. 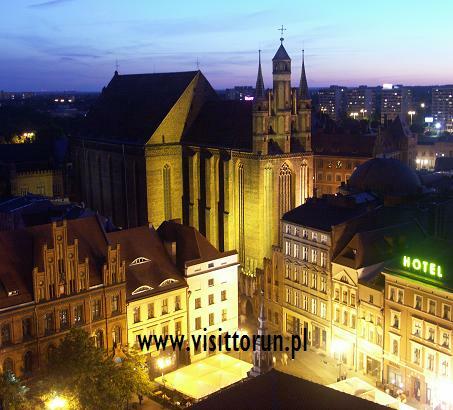 The Franciscan monks were brought to Toruń by the Teutonic Knights in 1239. It was the first and most important monastery in the whole of the Teutonic state, the seat of the Prussian custos. Here, during the synod of 1243, a papal bull was issued, dividing the land into the following dioceses: the diocese of Chełmno (including Toruń), the diocese of Pomesania, the diocese of Varmia (Ermland) and the diocese of Sambia (Samland). 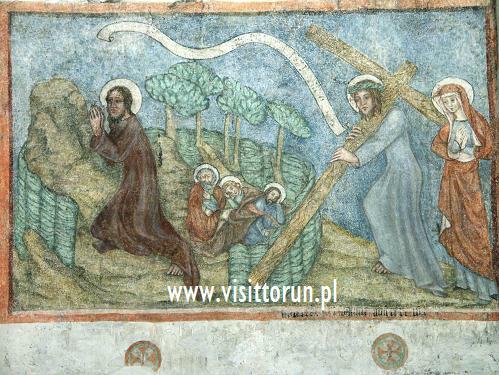 Toruń’s Franciscans kept annals (Annales Minorum Prussicorum), in which they recorded the important events in the history of the city and the Teutonic state. Here, a well-stocked library and a school were run. 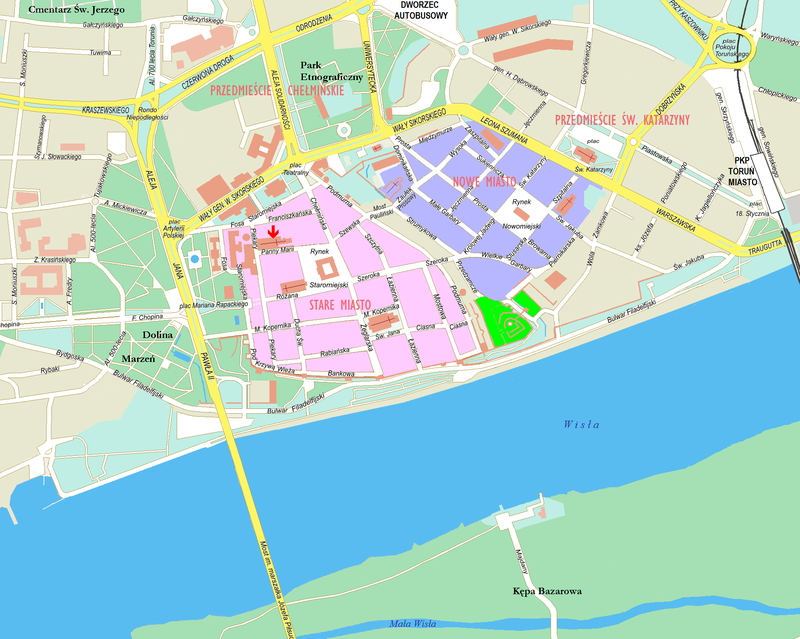 With the arrival of the Reformation in Toruń, the Franciscan Order disintegrated and the monks converted to Lutheranism and Calvinism, while the church and the monastic buildings adjoining it to the north in 1559 were taken over by the Protestant City Council. After adaptation, the buildings housed the municipal gymnasium, the later renowned Academic Gymnasium, until 1724. It was then that the buildings with the church were handed over to the Catholic Order of Bernardines, following the royal verdict pertaining to incidents of the Tumult of Toruń. In 1821, the order was liquidated and the monastery pulled down. Only a fragment of the west wing, adjoining the church to the north, has survived. 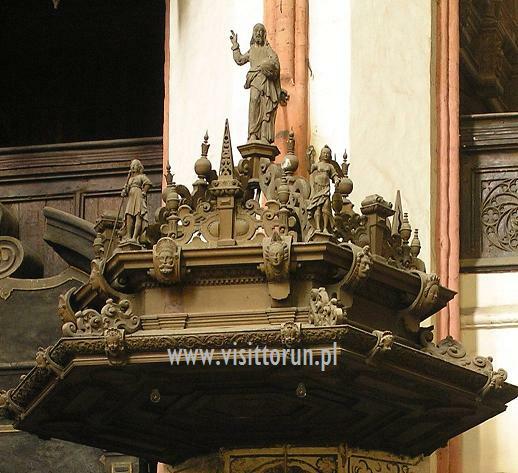 Between 1559 and 1724, the Church of the Blessed Virgin Mary was the major church in Toruń. 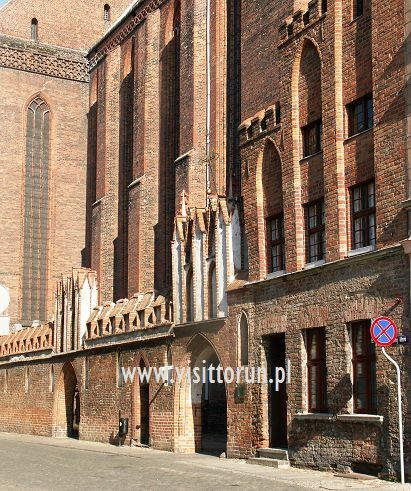 We enter the former Franciscan area through the gate in the Gothic wall adjoining the Panny Marii street. Walking along the Renaissance cloister with beautiful Mannerist gables above each of the arcades, we enter the church. Inside, our attention is captured by the slenderness of the church, emphasized by the high narrow windows with the nineteenth-century stained glass designed in the Gothic style, pillars separating the aisles and the interior buttresses in the south aisle, which form a kind of chapels. There is also about 27-meter-high polychrome stellar vault. The surviving elements of the interior furnishings can be divided into three groups. The oldest group, dating from the Franciscan period, include the Gothic polychrome decoration (1380-90) on the interior buttresses of the south aisle, highly valuable and of high artistic standard, depicting monumental figures of Saints against the unreal architectural background; the early fifteenth-century oaken stalls on both sides of the presbytery, richly and intricately carved; the Gothic figure of Christ in the Tomb in the north aisle. The next group, dating back to the Renaissance and early Baroque Protestant period, include the fine early seventeenth-century organ in middle of the nave; the early seventeenth-century pulpit overlaid with equally rich carvings next to the organ; the epitaphs of the local patricians in the south aisle and in the presbytery; the tomb of Princess Anna Vasa (>>) - the Starosta (a representative of a district) of Brodnica and Golub, the Protestant sister of King Sigismund Vasa in the presbytery. After the church passed into the hands of the Bernardine monks in the eighteenth century, some other elements were added, including the high altar depicting the Annunciation and the side altars in the nave. The Swedish Royal Princess Anna Vasa was born on the Eskilstun Castle on may 17 or 31, 1568. She was the third in turn child of the Polish Royal Princess Catherine Jagiellonka and the Finnish Prince, later the king of Sweden, called John III. Her brother Sigismund (1566-1632) was the king of Poland (1587-1632) and of Sweden (1592-1599). The family of Anna Vasa differed in the religious matters. Her mother was Catholic and her father Lutheran. The division influenced the philosophical beliefs of the children of the Royal Couple, who were initially raised Catholic. Sigismund remained Catholic. Anna, at the beginnig also Catholic, when around 15 converted to Lutheranism. It happened probably because of the tragic experiences related to the death of her mother or perhaps due to the influence of the second wife of John III. During Anna's life many attempts were made to persude her back to Catholicism. Royal Princess Anna came to her mother's home country together with Sigismund after the latter was elected the king of Poland in 1587. She was supposed to give him advice and to support him. At first she stayed at her brother's court in Krakow, later in Warsaw as well as at the court of her aunt, Queen Anna Jagiellonka. In 1604 Sigismund donated her with the starostwo over the district of Brodnica and in 1611 also over the district of Golub. In spite of many attempts at getting Anna married, always politically conditioned, she remained maiden all her life. Her main characteristics were intelligence and sagacity. She was also characterised by assertiveness and courage, as well as obduracy and steadfastness of her own beliefs. She created a religious asylum for her coreligionists in the districts subjected to her starostwo. She was mailny interested in botany and phytotherapy. All by herself she prepared medicines and ran a chemist's shop for her subjects. 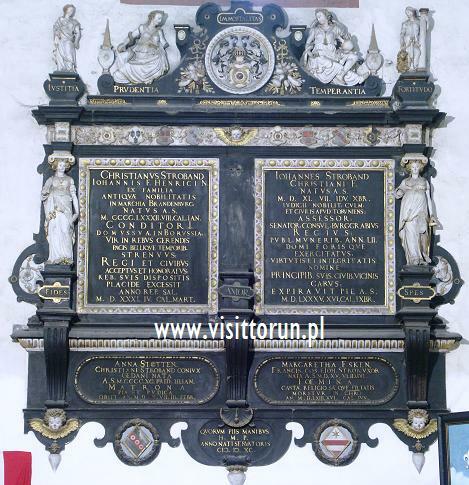 The Royal Princess died on February 6, 1625, on her Brodnica castle. Her Lutheran proffesion caused difficulties as far as her burial was concerned. 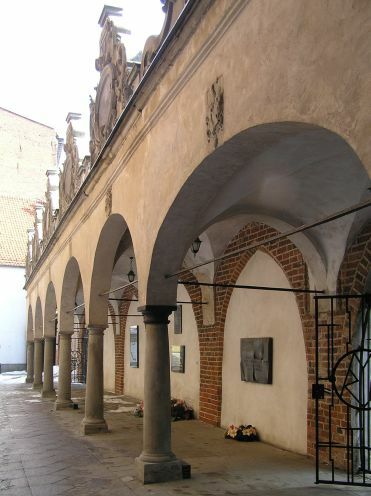 It was impossible to have her buried at the Wawel royal tombs in Krakow because of the canonical interdiction against burying Protestants in Catholic churches. 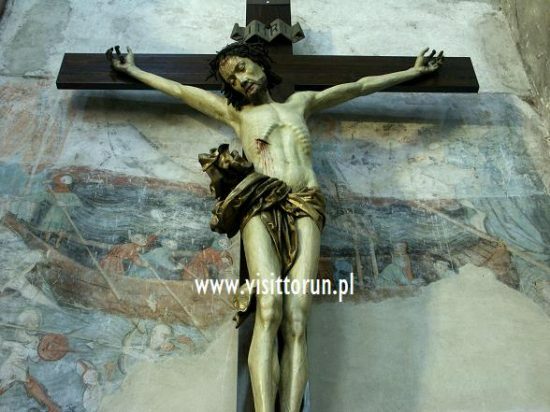 For the reason of creed her body was kept in Brodnica in a vaulted room on the castle. In the course of the Polish-Swedish war her body was desecrated and robbed, taken out of the coffin and deprived of the attire. 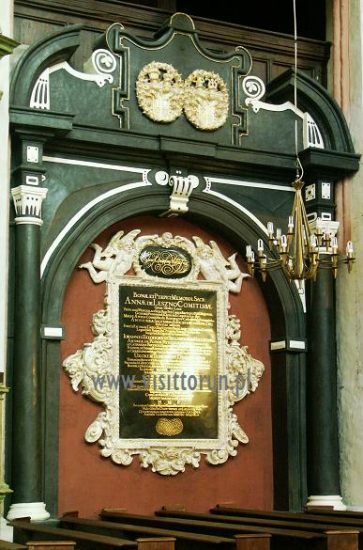 The ceremonial burial of Anna's mortal remains had place in Toruń's St. Mary's church, then one of the most important Protestant churches in Poland, following her death by 11 years. 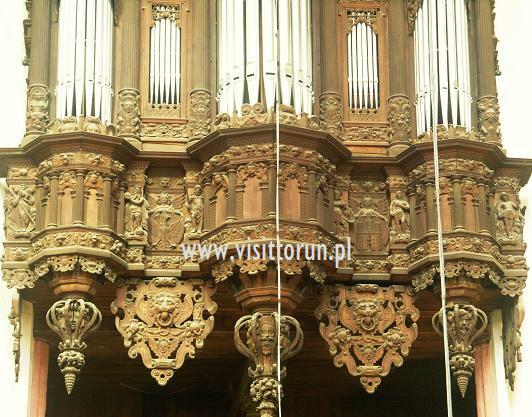 It was ordered by and paid from the founds of the late Princess's nephew, Polish king Ladislas IV. The exequies were made Protestant in character. They were very solemn. The usual modesty of Protestant ceremonies was given up probably for propagandist reasons and also in relation to Anna's royal descent. Maybe some of the injustices of the past can be redressed by permitting Lutheran services at St. Mary's.